Hi guys, This is Le Jester over here. Today i am gonna share with you about sealed dragons and why they are OP and can screw your opponent's aqua force deck. Okay folks lets discuss about the uses of this card. So its a counterblast 2 cards with seal dragons to get a +10k to retire all grade 2s on the field. The question you might wanna ask would be: Isn't Armor Break Dragon better where it retires the front row. My answer is both cards are strong and has its uses however i gotta say that sealed dragons are very effective against decks like Aqua Force. Why is that so? Storm Rider, Basil is a grade 2. Aqua force usually flood their field with at least 2 to 3 grade 2s on the field. And basil is one of the most irritating cards that would always hide at the backrow when finished delivering the 1st attack with it. So how do i kill that son of a gun? 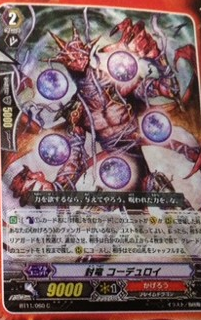 One way is to use cards like dragonic deathscythe, berserk dragon to target it and retire it for the same cost of counterblast 2. Another way is to kill them with the effect of blockade inferno. Another question about blockade inferno you might ask will be, what if opponent has only grade 3s and 1s on the field or he only has one grade 2? Let me introduce another card in this archetype of sealed dragons which will answer this question for me. 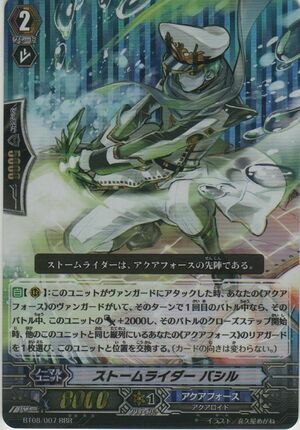 [AUTO]:[Counter Blast (1) - Cards with "Seal Dragon" in its card names] When this unit is placed on (VC) or (RC), if you have a <Kagero> vanguard, you may pay the cost. If you do, choose one of your opponent's rear-guards, and retire it, and your opponent look at up to four cards from the top of his or her deck, chooses up to one grade 2 from among them, call it to (RC), and your opponent shuffles his or her deck. So in this case... What if opponent controls a diamantes thats sits at the backrow as well. Here is one method to screw your opponent up. Use Corduroy to retire the diamantes and hopes he get a basil from the top 4 cards that he picked up to call to rearguard. So why a Basil? Coz you wanna screw up your opponent field and clear all the basils in the deck which will render their Blue Storm Dragon, Maelstrom useless without any 4th attacks. or alternatively you can retire their booster behind their vanguard to call a basil out. So what i wanna say is that Aqua force is totally no threat to seal dragons at all and is extremely fun to play and troll with. 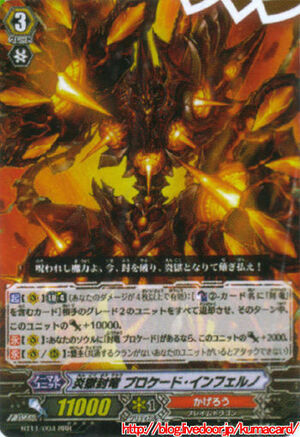 After babbling so much about the aboved mentioned combos, Can blockade inferno be played with Dauntless drive dragon? My answer is yes, You dont say. It can be played like a final turn kind of thing. Where blockade and corduroy help you clear all intercepters and rearguards, dauntless drive breakride ability help you to gain additional 10k attack power and also an ability to stand you vanguard again at the cost of discarding 3 cards. So in total, 11k + 10k + 10k = 31k unboosted vanguard and a 39k with a 8k booster. So in other words, your opponent has to drop a 30k guard for 1 trigger pass and 35 for two and 40 for no trigger pass. But what if i pull all effects into my vanguard and restand it again. So assuming i play criticals, It will be a 41k without any boost and if i were to get both trigger to power up my vanguard. So for the 2nd attack, it will be a 35k guard for 1 trigger pass, 40k guard for 2 trigger pass and 45k for a no trigger pass. To total up, It will be a 40k + 45k = 85 guard to guard the vanguard alone. And assuming both your rearguard columns are 18k, it be a total of 105k guard if your opponent do not have any negates on his hand. Oh well, that all for now folks, to conclude. Sealed dragons are Badasses that will be a potential OP contender alongside with narukami and their dragonic descendant.